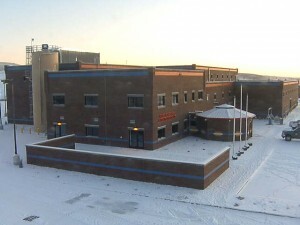 Expand and remodel existing headworks building, and public works shop building. Construct new laboratory, office space, primary lift station, operations building, MSABP biological treatment system, flash mix, flocculation and plate settler basins, drain lift station, and disc filter UV disinfection building, install new screen and washpactor equipment, associated yard piping, landscaping, electrical and controls. 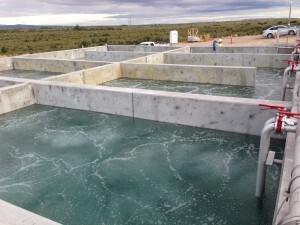 New WWTP including influent lift station, screening, biological treatment, membrane bioreactors (MBR), UV disinfection, biosolids and dewatering, laboratory, site work, and related items. Construct headworks building, primary lift station, membrane bioreactor (MBR) building with equipment and basins, process and scour air blower facilities, non potable water booster pump station, ultraviolet light disinfection, solids dewatering building comprised of a belt filter press and load out area sized for 2 MGD expandable to 8 MGD, maintenance building, administration building, a reuse water wet well for a future Class A reuse, wastewater pump station, and a standalone 2000KW standby power generation facility. Construct new treatment plant process building which houses 8 cast in place concrete filter boxes, a single-level chemical feed and storage area, electrical load center, operations & administration area, garage/shop maintenance area, 30-foot deep drain pump station, along with associated access roads, sitework, and landscaping. Construct a groundwater treatment system capable of treating arsenic and fluoride, including water supply treatment building, plant/utilities building, 30x60x10 concrete clearwell, water filtration and chemical injection equipment, cooling tower, potable water storage tank, two 500,000 gallon water tanks, building information systems, site utilities, roads, raw water lines, booster pump station, yard pipe and waterline replacements. Design-Build mechanical wastewater reclamation facility for the AVIMOR community. 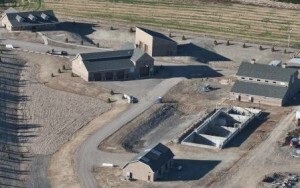 This is the first municipal design-build filtration wastewater treatment plant in the State of Idaho. Construct process tanks, combination headworks/solids handling building, process building with generator room, underground chlorine contact chamber and lift station. Reclaimed water from this facility will be used for irrigation in the AVIMOR Community. 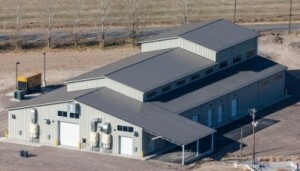 Construct a 2-million gallon, cast-in-place concrete, earthen-covered, treated water storage tank, install yard piping, overflow structure, precast control building with chlorination system and transmission main line leading up to the tank structure. Construct a 1.1 million gallon cast-in-place, earthen-covered, treated water storage tank (110 ft diameter x 16 ft. water depth) with a precast concrete cover. The work includes excavation, backfill, yard piping, site grading and seeding. Construct new filtrate tanks, improve and modify dewatering building, site work, yard piping, and process instrumentation and control system including MCC and distribution system reroute. Improve the existing wastewater lagoon treatment facility, construct new membrane bioreactor (MBR) mechanical wastewater treatment process with cast-in-place concrete basins, blower building, headworks building with screenwash system, and UV disinfection facility, install displacement blowers, permeate pumps, WAS pumps, mechanical piping and electrical systems.